Filmmaker Noah Baumbach is on a real winning streak as of late. His recent string of works of exploring deep personal journeys have been both dark, uplifting, and entirely endearing as charming pieces of both art and entertainment. His latest ensemble feature, The Meyerowitz Stories (New and Selected), assembled as a series of character vignettes stars Adam Sandler and Ben Stiller as duelling half-brothers both suffering from their aging artist father Dustin Hoffman's tiresome antics. 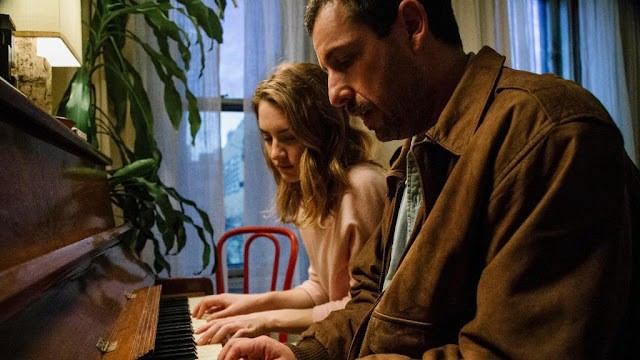 In a story of fractured families and adult relationships, Sandler really grounds the film as the oldest brother displaced after a divorce and years of being a stay-at-home dad to his now college-bound daughter, Eliza (Grace Van Patten). Sandler and Patten have a great father/daughter chemistry. Sandler's Danny cares and bonds with his daughter in a way his father never did. Sandler and Stiller, longtime colleagues and contemporaries, have a great antagonistic yet caring rapport. Despite being the same age and not immediately being relatable as older/younger siblings with different mothers, their layered interplay and dynamics prove genuine and dramatic. Using the storytelling chapter structure allows Baumbach to skip or bypass superfluous material making the whole film a smoother experience. Standout Elizabeth Marvel as the often ignored and put-upon middle sister is hysterical in her downplayed mousiness. It's a small but genuinely affecting performance of the good but boring daughter who never causes any troubles, always helps out yet is perpetually forgotten. Hoffman is particularly charming in how frustrating his character is as a perpetually cranky, unsatisfied artist who passively takes out his insecurities on his differently successful children. Emma Thompson delightfully plays Hoffman's flaky, alcoholic fourth wife with a breezy zeal and charm. Baumbach, in general, is in fine form balancing his cast and their dynamic relationships deftly. The Meyerowitz Stories is such a textured film of layered performances extolling fractured father/son relationships splendidly. The welcome chapter structure allows for only the best material to be dramatized and the characters to shine in different point-of-views and interpretations telling their own stories while supporting others'. Baumbach's latest in another winning film of family and personal neuroses. The Meyerowitz Stories (New and Selected) is available for streaming now on Netflix.